Ok, yes I know – I said that Part 8 was the last in this particular series – but then Microsoft went and released Cumulative Update 1 (CU1) for Exchange 2013 (on April 2nd) which left me feeling that if I did not cover this – then the LAB series was not properly completed. For those of you who are just joining us – you can find links to the previous parts below. We covered Database Availability Groups and provided a script which automates the creation of DAGs from a CSV. We covered adding databases to the DAG and configuring SSL. We covered the creation of user accounts in Active Directory then using EBUCT tool to create the user Mailboxes, then the creation of a number of Distribution Lists rounded off with the creation of “Modern” Public Folders. What is Cumulative Update 1 – in fact, what are Cumulative Updates? For more detailed information on CU1 for Exchange have a look here at the launch announcement. 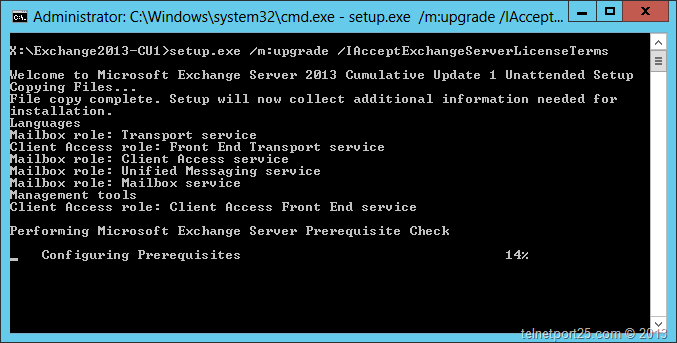 The Cumulative Update Servicing model is new to Exchange, but not a new concept. People who have worked with Lync server will be very familiar with the concept. From Exchange 2007 many of you will be know that Exchange used Role Up’s as interim collections of “hotfixes” with the occasional feature change between Service Packs ~ however for Exchange 2013 updates will be quarterly using the Cumulative Updates Service model. 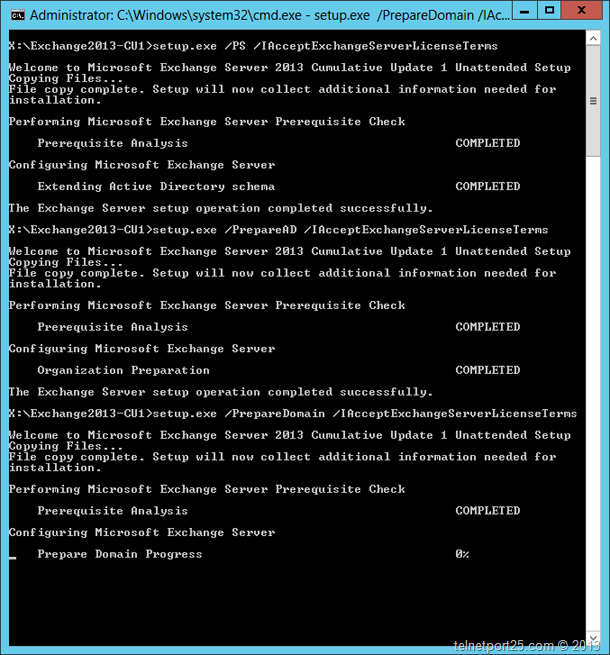 Each CU is a full Exchange standalone image, which means that it cannot be uninstalled (unless you remove all of Exchange) and should a CU fail part of the way through – you will have to recover the Exchange Server using the /M:RecoverServer – again this is not new as the traditional Exchange Service pack used this model. Service Packs are still likely to be provided periodically. Before I get into the process of performing the upgrade to the lab – it is probably worth you having a read of the article that I wrote here about some additional steps that I have found over the years that can help ensure that an upgrade goes smoothly – in particular the bit about ensuring there are no reboots outstanding. As this is a LAB I will leave it up to you if you go through the steps of backing stuff up (just remember in production that is a mandatory step!) – so without any further “ado” – lets get to the upgrade process. Therefore log onto art-MBXCAS-01 and download the Exchange 2013 CU 1 update from: http://www.microsoft.com/en-us/download/details.aspx?id=38176. When you have downloaded the binary double click on it to extract the installation to a location on the server. You can save time by copy and pasting each of the above commands into a PowerShell script file (which I have done in the screenshot below) and then executing that from the Exchange Management Shell. Alternatively you could also make use of Michael Van Horenbeeck’s rather excellent automated script which you can get from here. If you do choose to use a script file – remember the guidance that I provided here to execute script file from the Exchange Management Shell. Setup will then begin the process of upgrading the Schema – see below. Just so you know I am going by the release notes here – normally I would have expected the /PrepareAD switch to prepare the schema and the domain – but I did not get the chance to test this idea, so I stuck to the Microsoft provided guidance. The output of the /PrepareAD switch is provided below. The output of which is provided below. 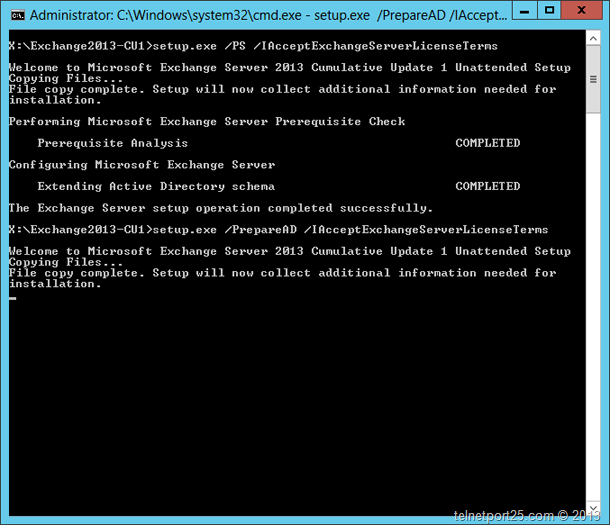 Setup will then begin the process of upgrading the Exchange installation on the server. When Setup has completed I recommend that you reboot the server even if you are not prompted. There has been some discussion on a few mailing lists that I am a member of which suggests that the unattended setup should always prompt you to reboot but is not doing so (whereas the GUI setup does) – I have been seeing this as well. 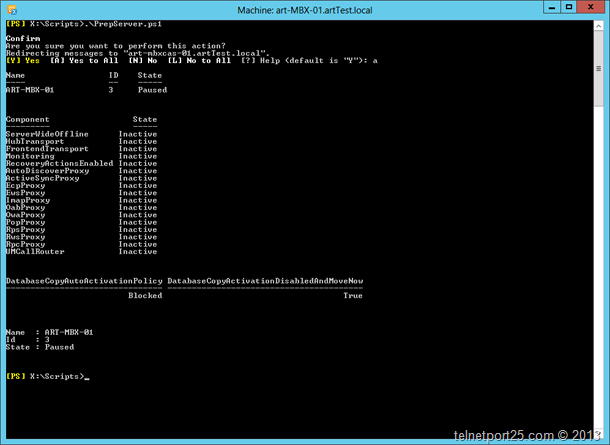 When you have rebooted the server you need to return is back to normal operation (take it out of maintenance mode) by using the following PowerShell commands from within the Exchange Management Shell (again thank you goes out to Brian Reid for these command lines). You can, like with the commands to place the server into maintenance mode copy these commands into a PS1 script file and execute them from within the Exchange Management Shell (which is what I have done in the screenshot below). You are now ready to move onto art-MBXCAS-02 and then finally art-MBX-01 (remember to upgrade art-MBXCAS-02 before art-MBX-01). You also do not have to repeat the Active Directory preparation steps. Ensure that after the upgrade has completed and you have rebooted the server to take it out of maintenance mode. Right, that is that certainly for this series. There will of course be further Exchange 2013 shenanigans that I write – but I think, as Gordon Ramsey would say – Done!. When I installed it on the first CAS server, it went checking the prerequisites and automatically prepared\extended the schema. MVP Award for 2013 – half a decade ~ wow!